This morning I woke up around 09:30. I’m in the luxurious position to have the house to myself today! Even though it’s great to have my own place, it was a little bit frightening last night as well.. what if someone would enter or anything?! I knew it wasn’t going to happen, but still made me worry a bit. The morning was all about making plans; Nyumushka, the girl I met at the Canvas and Wine meeting invited me to join her tomorrow for a hike to the Bogd Kahn mountains. Right here in Ulaanbaatar. And the day after tomorrow I will meet another girl to see the Yurt suburbs of Mongolia. Could also be interesting :)! Am happy about the plans. Just for reference, at 09:30 the outside temperature is still -10! Enough plans made, time for some culture! 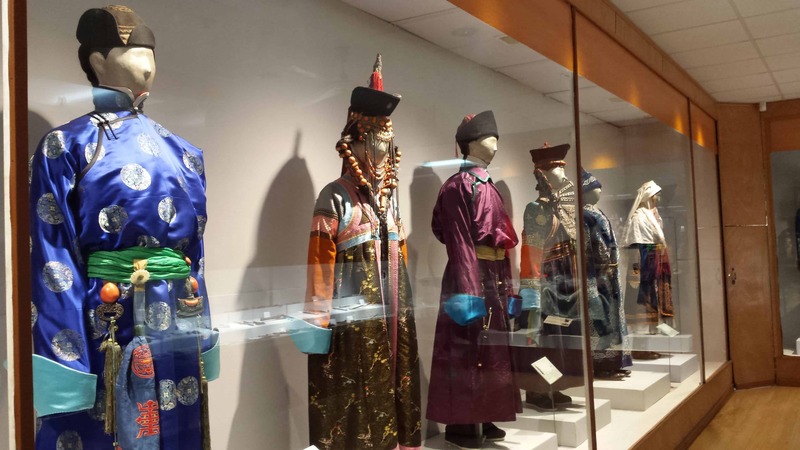 I first visited the National Museum of Mongolia. 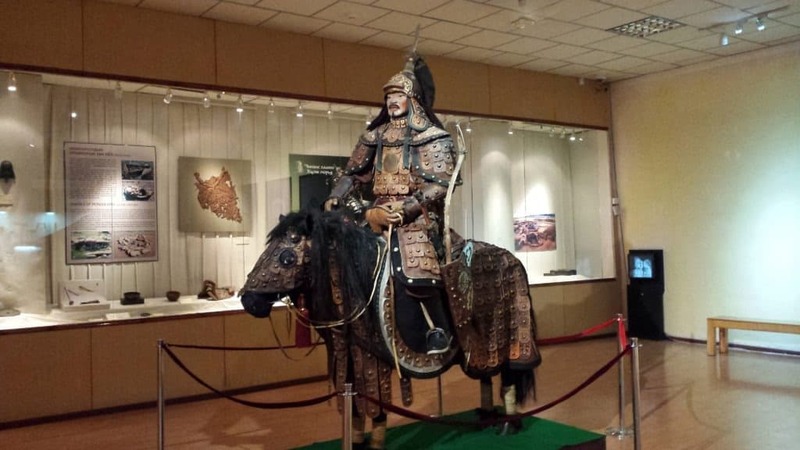 A great museum that explains the history of Mongolia from prehistoric to present times. Did you for instance knew that Mongolian citizens are free to travel abroad since 1991 only?! Or did you know that Mongolia used to be a communist country that fully depended on Russia from 1921 till 1990? And that the country changed from communism to democratic due to a series of demonstrations including a hunger- strike? Or the fact that before 1921 less than two percent of the population could read and write. But after a large scale literate campaign nearly 96% of the population was literate by the end of 1989? 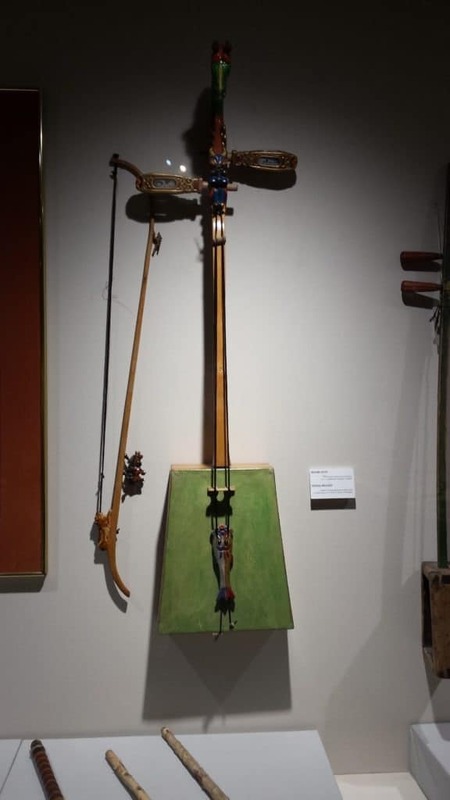 Apart from historic facts and political changes the museum also showcases cultural items such as traditional clothes and music instruments like the ‘horse- headed fiddle’ and the ‘two stringed plucked lute’ both of which I’d listen to later today. 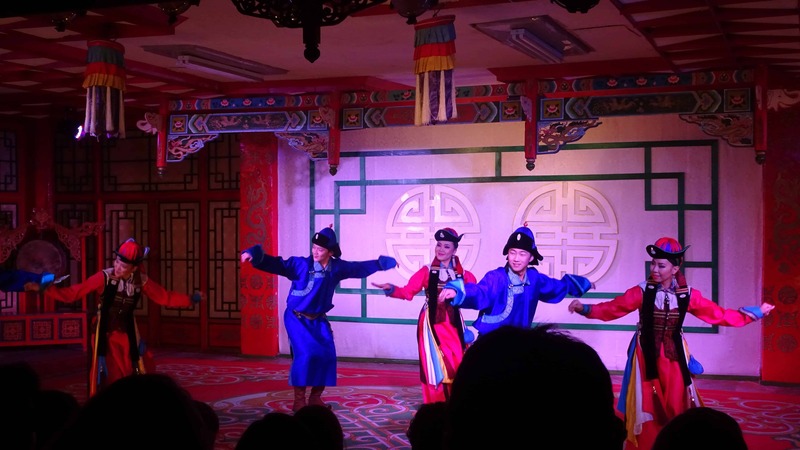 After the museum it was time to go see the National Song and Dance Ensemble of Tumen Ekh. 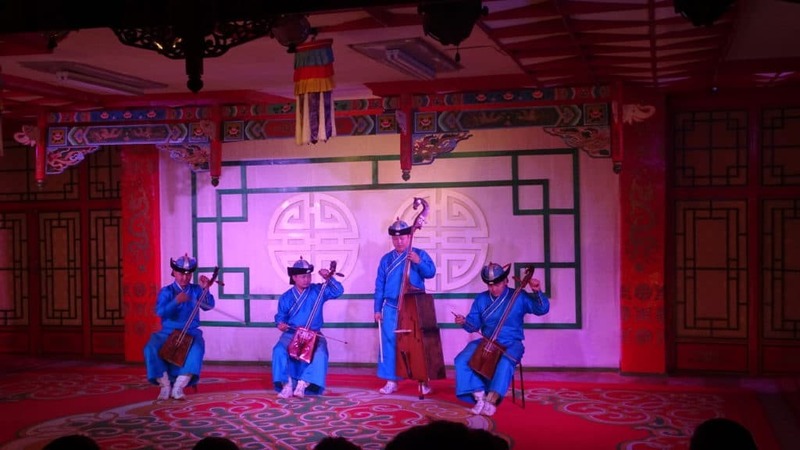 A group that is described to be one of the best national song and dance ensembles in Mongolia. 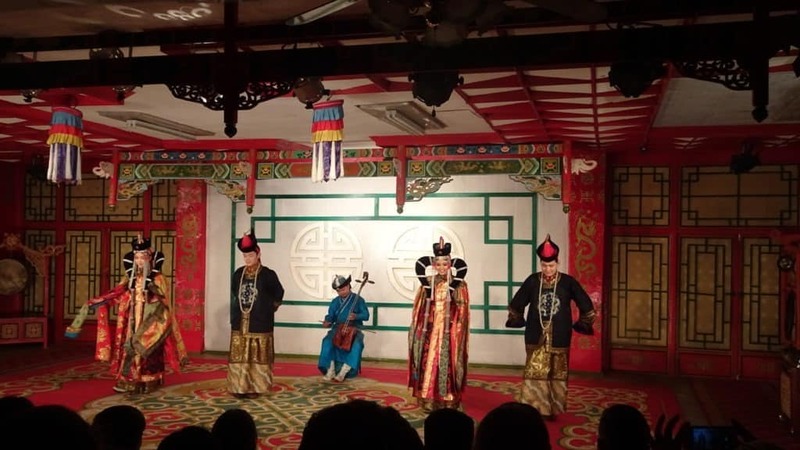 The performance was held in a super cosy theater and was brought in three different pieces; first there were music, singing and dance performances in the traditional culture. After this the ensemble performed a set of different choreographs, followed up by a mix of modern and traditional performance art. The show had many features! We were brought songs, traditional music instrument plays, khuumii (throat)singing, folk dance, shaman dance, contortion and a religious mask dance. All performed on a very high level. 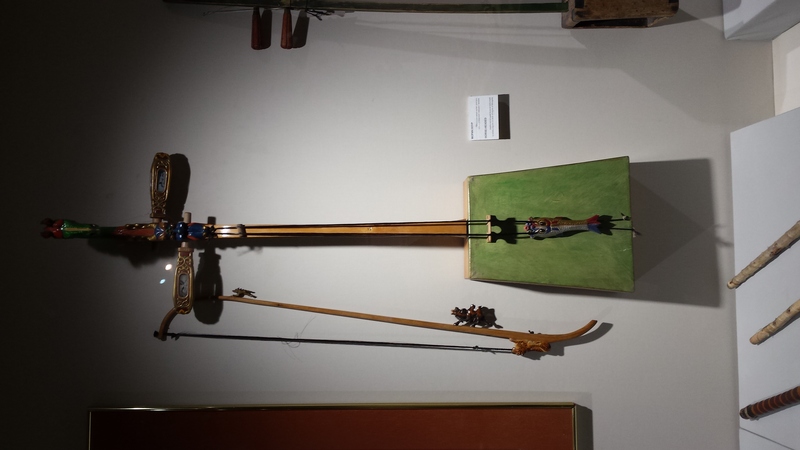 I especially enjoyed the sounds of the traditional music instruments. 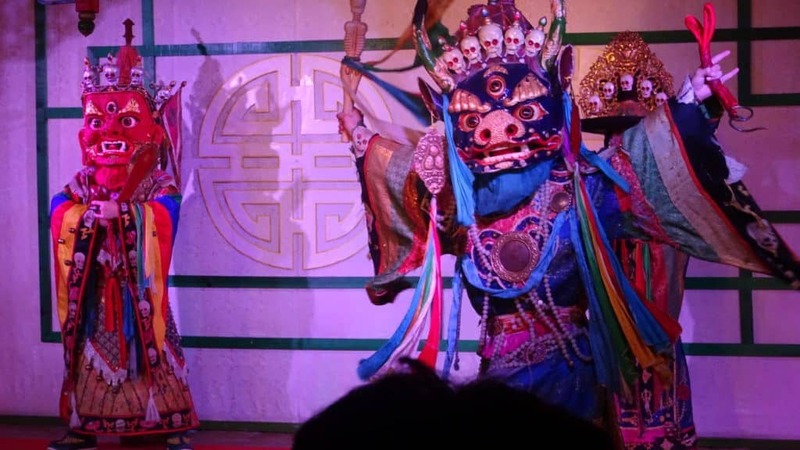 The pure and overwhelming sound of the singing voices and the playful mask dance. The throat singing was an experience on itself; a very deep voice that simultaneously makes different/ higher/ multi toned sounds. Super special and definitely a form of art I’d say! The traditional dance moves had a very soft and sweet appearance. And the whole group of musicians were just amazing! They were super skilled and produced so many sounds all together. 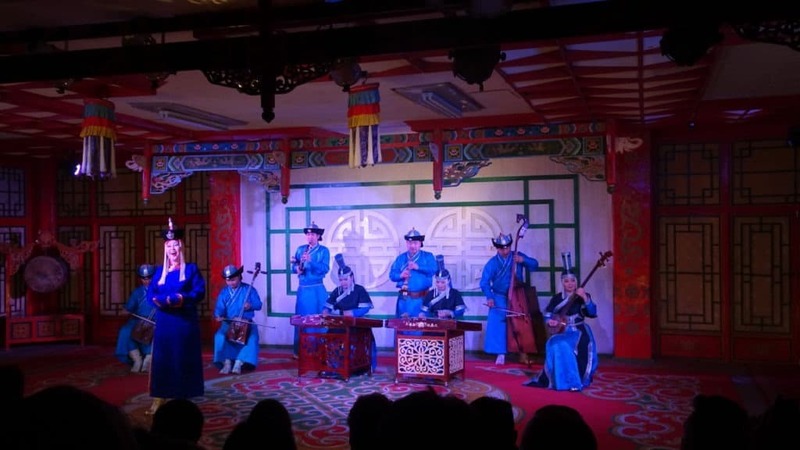 Combined with vocalist with great voices and the beautiful traditional outfits this performance gave a great insight in the (traditional) Mongolian way of life. If you by any change are in Ulaanbataar any time soon, this is something you don’t want to miss out! 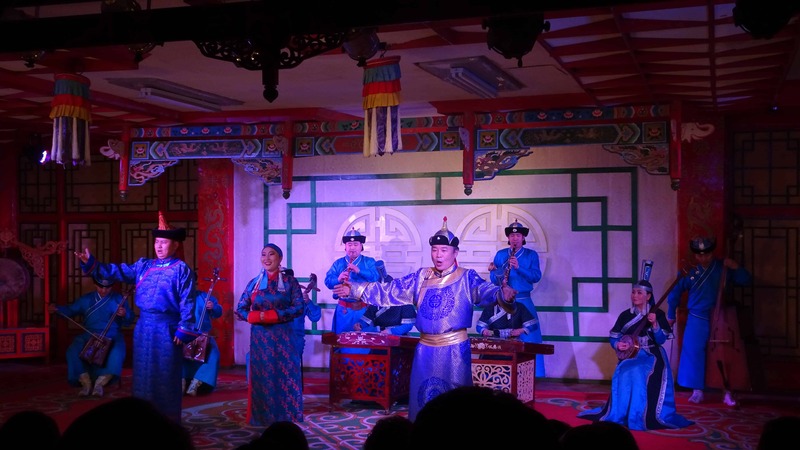 You’ll be amazed by the high level performance and the uniqueness of the culture. Singing and playing – amazing!